The user interface of the program was designed to make microinjection as easy as possible. 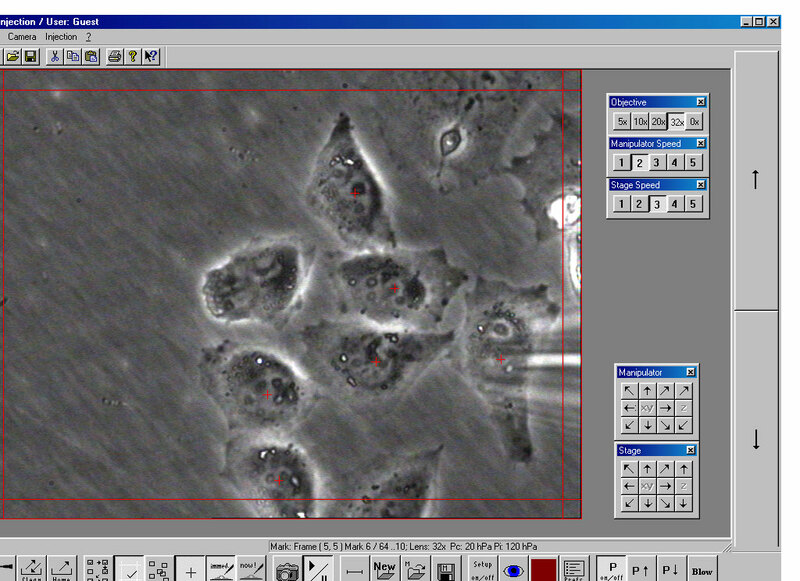 Once the cells are placed on the microscope stage, the capillary is loaded with the sample and fitted to the micromanipulator, the entire instrument can be controlled on screen. Whatever parameters need changing, it can be done by the controls in the main application window as seen on the screen shot to the left. 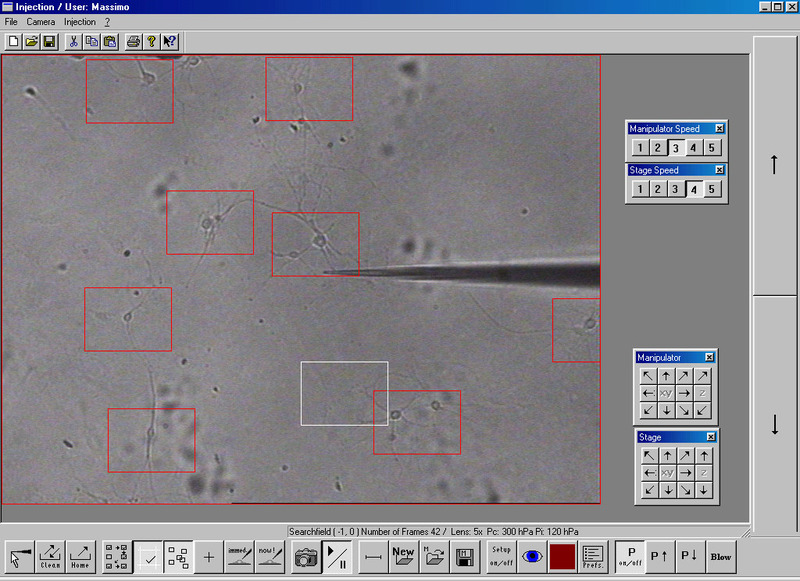 For microinjection the user points to the location to be injected and then clicks the left mouse button. 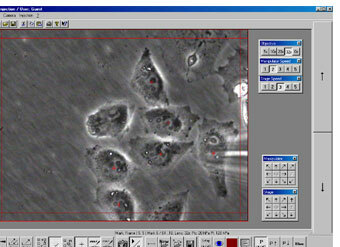 Cells can be premarked for batch injection, or injected immediately after marking. Navigation is simplified, a click into a frame margin takes you to the next frame. 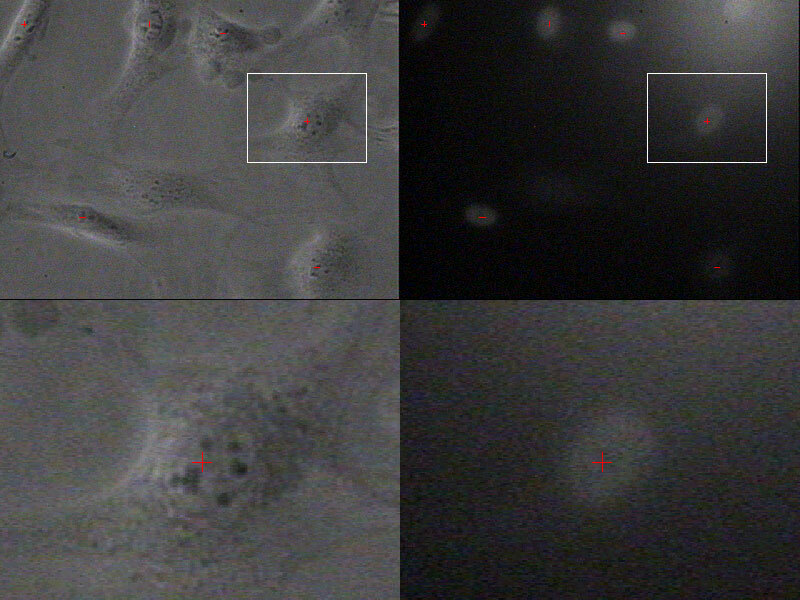 If only a few cells are available for microinjection - as in primary neuron cultures - a free frame definition mode allows for preselection of cells in the overview magnification. The AIS 2 FemtoJet is completely integrated into the program. Special buttons allow for quick increase/decrease of injection pressure. Also, injection time can be controlled very sophistically. For calibration of self pulled capillaries the bubble test is supported as described in Schnoor et al., Exp. 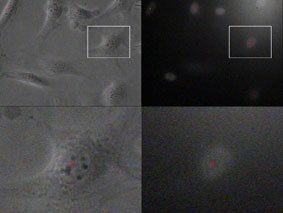 Cell Res. 210, 260-267, 1994, using the published algorithmus to output the tip diameter. The program also comprises an imaging part for automated image grabbing, picture comparison, filter and palette functions. The upper part of the picture comparison window show the images to be compared reduced to a quarter of their original size. Clicking to a certain point in one of the upper images centers a region of interest (ROI) around that point. This ROI is then magnified in the lower part of the Picture comparison. The ROI window in the image to be compared is placed automatically according to the position clicked in the other image. Clicking into the lower part with the right mouse button increases magnification, clicking with the left mouse button decreases magnification, thereby increasing/decreasing the ROI in the upper images. Click into image to view in new window at original size.